What is the process for getting my machine repaired? You can drop off your sewing machine any time. We are open Monday-Friday 9am to 5pm. and Saturday 9am to 4pm. Your machine will normally be ready in 7 to 14 days. Ordering of parts may require a bit more time. Our technician has preformed service and repair in our store since 1973! What is the Cost to Repair my machine? A Complete Clean, Oil, and Adjust of any sewing machine is $79.95 plus parts and tax. You can also bring in your machine and we will be happy to evaluate what is required... We offer this at no charge. Do you repair Commercial/Industrial Machines? 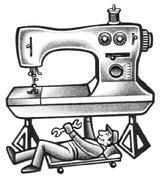 Sorry, we do not service/repair commercial machines, sergers, blindhemmers, embroidery, or quilting machines. We repair Bernina Brand Sergers. Sorry, we do not repair other brands of sergers.